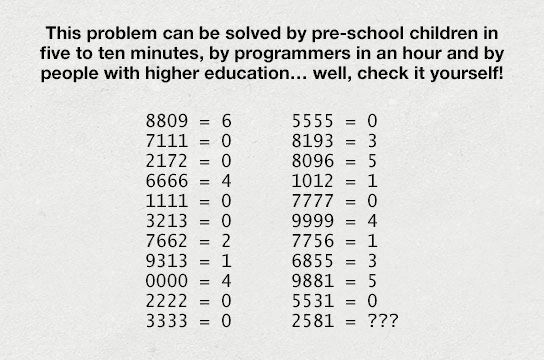 I’ve only just started tackling these logical puzzles – think it’s about time I get stuck into them! There’s loads flying around & in order to not miss them I’m going to capture them here. I won’t be posting the answers, nor do I want you to post the answers either! 10 philosophers meet and one decides to make a bet. He says he will put all his ten 100 euro bills in a basket. Then each of the philosophers will take one and only one 100 euro bill. He will be the last one. After he takes his bill, the basket will still have a 100 euro bill inside. If he succeeds, the other philosophers will need to pay him 100 euro each. If he doesn’t succeed, he needs to give them the money. What is he going to do? There was a road construction and a lot of people didn’t like it. After a while of constructions, people on pension started calling an old lady and complain to her about the construction, nevertheless she wasn’t part of the firm or had anything to do with them. Can you explain why this happened? Two trains are heading each others and will crash in a matter of seconds. There are no secondary tracks and the brakes don’t work. How can the accident be avoided? There is a 15 year old boy studying in a high school. He loves ice hockey and is the best of the team from his year. The team has been excellent in the high school championships. Recently, the dean and the teacher’s council had a meeting where they decided he is so good they must dismiss him from the team. Explain why. In the world championships of relay running in 2654, the Chinese team will be the last to cross over the finish line (as in, the slowest team). However, they still won. Explain why this happened.